Club Ice Hockey played a home-and-home set against the Lions of Columbia University on Saturday, November 11th and Sunday, November 12th. The Pride traveled to Mount Vernon, New York on Saturday and came out on fire, taking a 5-1 lead after the first period, behind 2 goals apiece from Joe Grice and Andrew Gagnon. Matt McGuirk added the other first period tally. In the second period, the Pride could only notch one goal from Collin Ewald, while Columbia scored three times to bring the Lions closer at 6-4 heading into the third period. 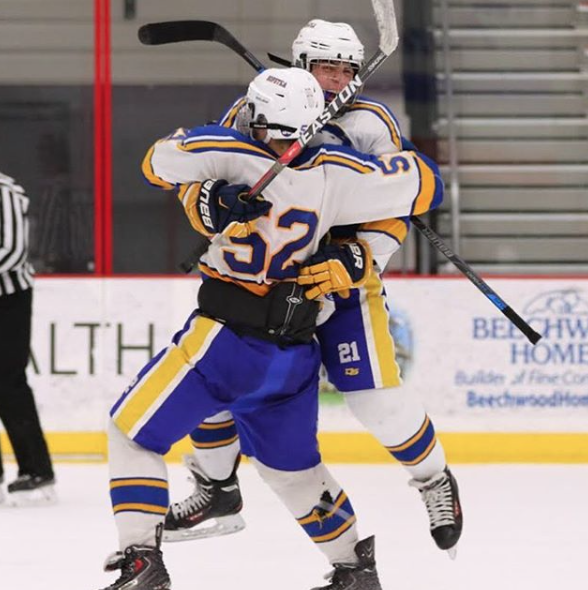 The Pride would pull away in the 3rd period as John Voiklis, Matt McGuirk, and Andrew Gagnon each scored a goal to help Hofstra claim a 9-5 victory. Gagnon’s 3rd period goal completed his hat trick, his 2nd in the last 3 games. The Pride looked to take their winning momentum to the Northwell Health Ice Center in Eisenhower Park, East Meadow, New York on Sunday. The Pride looked slow out of the gate as Columbia came out strong, but 2 goals from Gagnon and another from Elijah Vaillancourt cut the Columbia lead to 4-3 at the end of the first period. In the second, goals from Chris Serio, Zack Lamberti, and Gagnon again put Hofstra in front 6-5. Gagnon’s goal completed his 2nd hat trick in a row and 3rd in the last 4 games. Halfway through the third period, Columbia would tie up the score and then take a 7-6 lead with less than two minutes remaining in the game. With 28 seconds left, Zack Lamberti tied the game at 7 and sent it to overtime, where Andrew Gagnon would add his fourth goal of the game to win it for the Pride 8-7. Club Women's & Men's Ultimate Frisbee joined forces for the Northeast Mixed College Regional tournament in Northhampton, Massachusetts on Saturday, November 11th and Sunday, November 12th. The Pride came away with a 2-4-1 record at the tournament and came in 19th place. Both teams enjoyed the opportunity to come together and compete. Club Softball traveled to Fordham University in the Bronx, New York to take on the Rams on Sunday, November 12th. Despite jumping out to a 7-0 lead, the Pride were unable to hold onto the lead as the Rams came storming back to tie the score in a game that ultimately ended up deadlocked at 7. In their second game, Hofstra played strong defense behind the pitching of Sami Cusano, but a lack of hitting and some untimely errors cost Hofstra as they fell to Fordham 5-0. Club Women's Lacrosse competed against Fordham University on Saturday, November 11th in the Bronx, New York. Linnea Barbour would lead the Pride with two goals and Amanda Zaino would add one. Maria Lao had five saves in net and Jessie Allendorf won five draw controls. It wasn't enough for the Pride to come away with the win as they fell to the Rams 10-3. 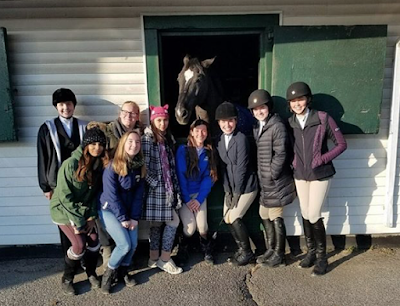 Club Equestrian competed at the North Shore Equestrian Center in Brookville, New York on Sunday, November 12th. Club Rock Climbing traveled to Brooklyn Boulders in Queensbridge, New York on Saturday, November 11th for their weekly climb. It was another great week as everyone enjoyed the venue and worked on some challenging routes. 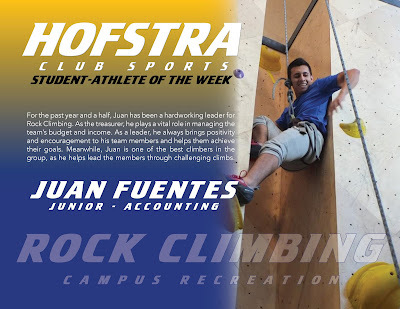 For the past year and a half, Juan has been a hardworking leader for Rock Climbing. As the treasurer, he plays a vital role in managing the team's budget and income. As a leader, he always brings positivity and encouragement to his team members and helps them achieve their goals. Meanwhile, Juan is one of the best climbers in the group, as he helps lead the members through challenging climbs. Congratulations to Juan!